We see a lot of bikes around here. A LOT of bikes. I personally would see at least 30 new bikes a day in my wanderings around the net. Scott would probably see even more. 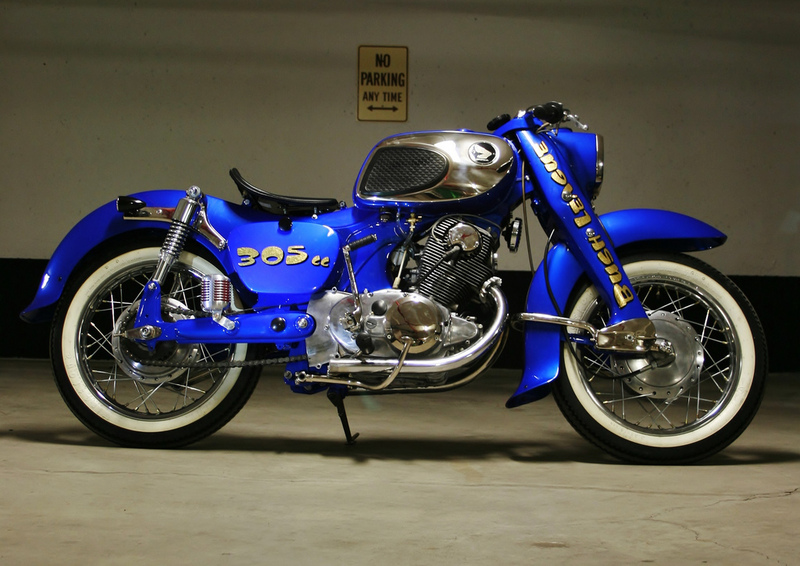 I see a few really cool bikes; just about anything from wrenchmonkees will tick that box. Deus too. Then there’s the nice bikes. Well built and fun to own, but no show stopper. Then there’s the average bikes. The forgettable bikes. The not-quite-finished bikes. The tacky bikes and the just plain crap bikes. And that’s just the tip of the iceberg. But there’s one thing I hardly ever see, and that’s really original bikes. Bikes that just jump up and grab you buy the eyeballs and say “seen anything like me before, punk?” In the last 6 months I have seen exactly two of those bikes; the Moto Guzzi Boardtracker and this one right here. 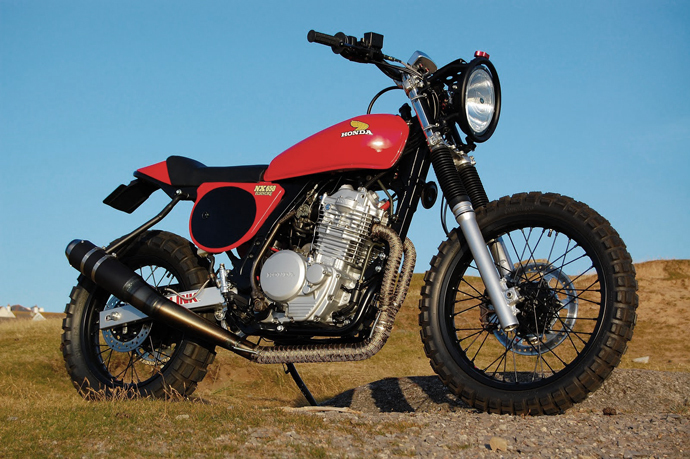 Say “hello” to Glenn McNaughton’s Honda XL 100 “minimus”. Born in Toronto, Canada (The Great White North). I spent the majority of my youth surfing in Central and South America with my cousin. When I ran out of money (and excuses) I decided I needed to start working, so I got a job in finance and was relocated for work assignment in Vancouver where I spent the next year wrenching on my landlord’s Guzzi in exchange for his wife’s cooking. After a good run in Vancouver, I moved back to Toronto to be with a girl now my fiance. After a year of living together, she purchased me a 1966 Honda 305 Dream as a birthday present, that’s when I knew she was a keeper! We purchased a house near the water so I wouldn’t feel so landlocked and then she announced she was moving to Boston for her PhD so I did what any logical guy would do turned my living room into a motorcycle garage! That’s where the term Bush League came from; it was a really Bush League operation. All the right ideas, all the wrong tools! A year ago we featured another Honda CL350 built by Jonathon Wood (AKA Woody), which was one of our favourite builds of 2009. 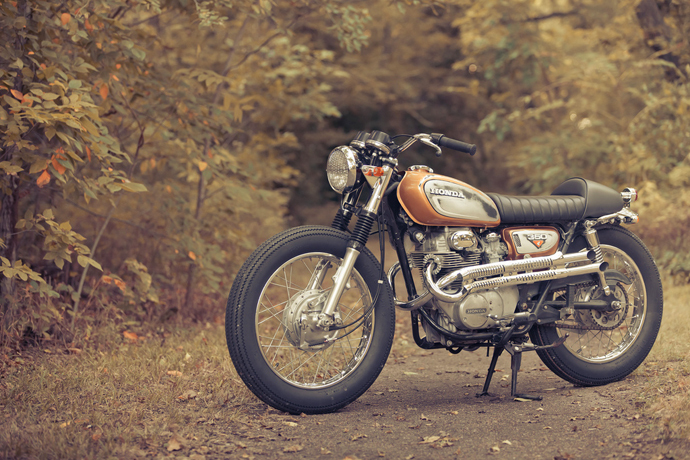 Instead of creating another cafe racer, this time Woody created what he calls a ‘Brat Tracker’. “It’s basically a bratstyle and street-tracker inspired motorcycle” says Woody. This latest project was based on a “super clean” 1972 CL350 that he picked up a little while ago. 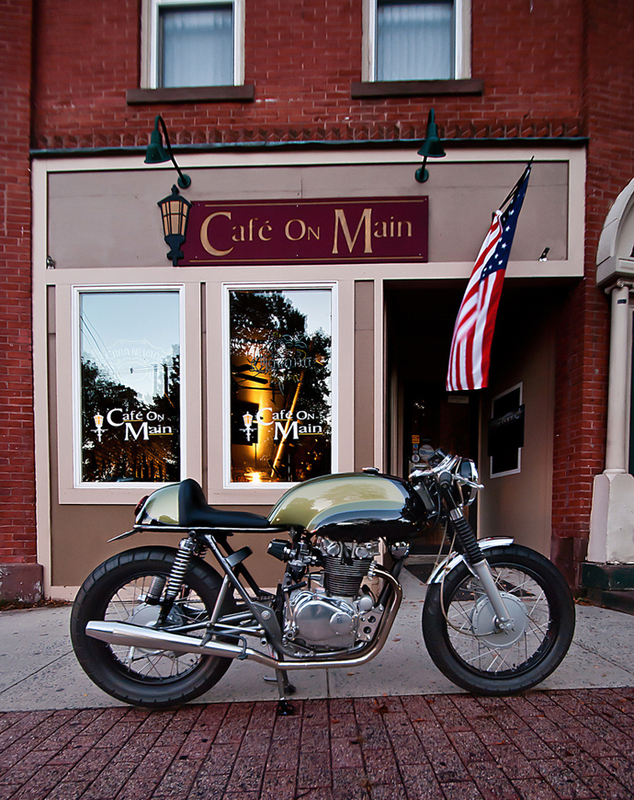 There’s no denying that the Portland café racer scene is alive and well. Especially when we keep coming across stunning bikes like this 1971 CB750, owned and built by Portland local Phil G. It has been his project and obsession for the last 2 1/2 years but doesn’t want to take all the glory. “I would like to sit here and tell you that I did it all myself but i have to give credit were credit is due” says Phil. While the overall concept and design of the bike was all Phil, there are a few very important elements that would not have been possible without the help from his very talented friends. “I have to say thanks to Sam Hill for welding the custom oil tank and the 5” stretch into the fuel tank, also to Sean Smith for laying down the beautiful black paint, Paul Burdette for the stage 3 port job and general engine building help, Ginger McCabe of New Church Customs for the seat pad, and to Deon Staffelbach for the awesome photography. Other than that I pretty much did everything myself.” I asked Phil why there’s so many custom bikes coming out of Portland and he replied “maybe it’s the long wet winters, plenty of time to build, not a lot of time to ride.” With winter approaching over there, we look forward to seeing more impressive builds after they come out of hibernation. Thomas Lonnen has been building and riding bikes since he was a kid – although building this bike was no child’s play. 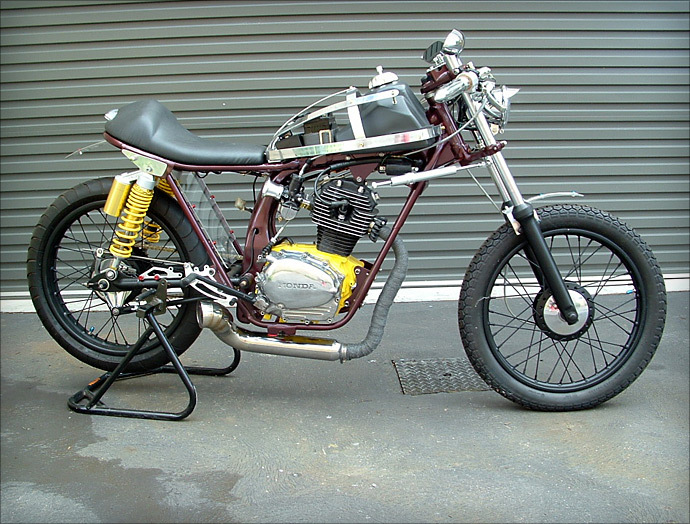 After having an accident and breaking his leg quite badly on a 2001 CR250, he decided to use the CR engine in this café racer project. Starting with a Honda CRM250 he cleaned the frame of brackets and welds then made the subframe to suit the aluminium body work – which was all beautifully home made. “I’ve been a welder since I left school” said Thom. “That’s the forth tank I’ve made and they are getting better each time.” Thomas then fitted the CR250 motor with a lighting coil making it AC electrics, “so I had to borrow a horn from an old vespa” he says.” The forks were taken from a Suzuki GS400, motard rims from an XR400SM and the overall weight of this super light bike is under 90Kg. An amazing ‘before and after’ shot can do wonders shifting products. Just think of all the diet products that are sold by showing a photo of a fat person and right next to it the same person now slim with an amazing six pack. Sometimes the improvement is so incredible you can’t believe the transformation. It’s similar to when I first laid eyes on this beautiful looking street tracker – it was hard to believe it came from a beat-up 1992 Honda Dominator. Luckily there’s people like Andrew Greenland, who didn’t see an out of shape body but a hot street tracker waiting to get out. We always love receiving motorcycles from our readers in far away places. 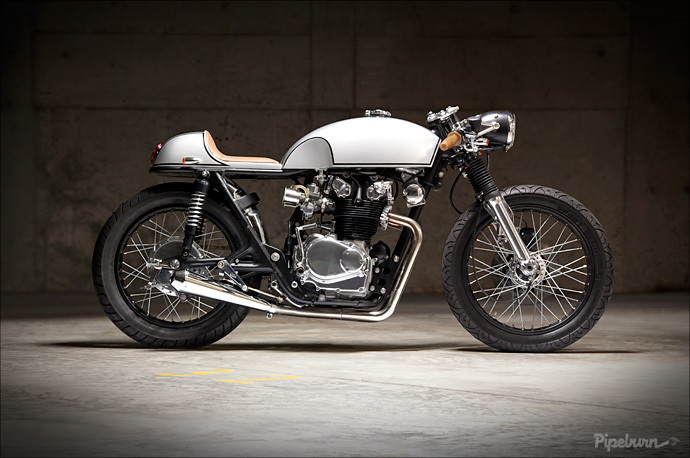 This Honda CB750 café racer was built by engineering student Ilkka Töyli from Finland. The bike has an original Dunstall racing tank, clubman bars, Suzuki GT front end /w dual disc brakes, Dunstall rear sets, chromed swingarm and a seat built by Ilkka himself. “I also designed the Dunstall logo on the tank purposely to resemble the old Ducati double-line logo” he says. 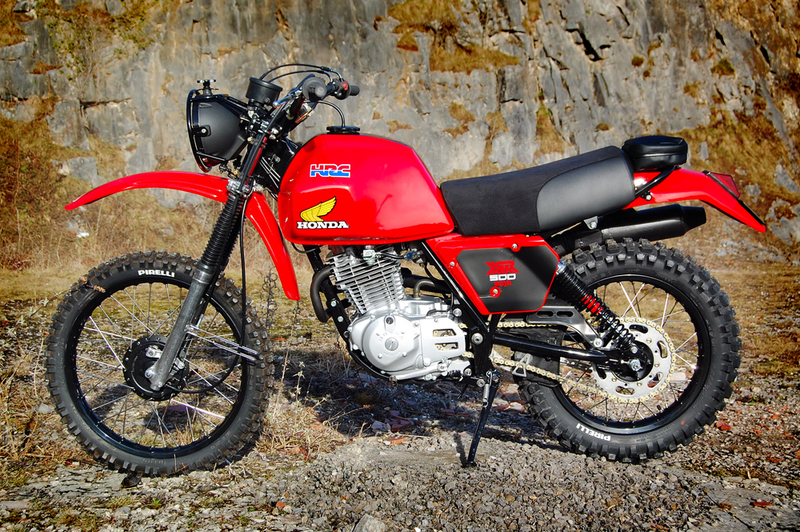 The bike took around 10 months to build and is Ilkka first ever bike – not bad for a poor engineering student.